​​​​​​​​​​​​​​​​​​​​Are you the kind of guy who thinks he can get by without wearing a transitional jacket between Fall and Spring? The type who always wears a T-shirt in April when (at least this year) it is still only 40 or 45 degrees outside? Pretending like you're not freezing as you leave your office on your lunch break? Well, don't be that guy. No one looks up to a man who is inappropriately dressed. It may be time for you to buy a transition weather jacket—a windbreaker. When you hear the word windbreaker, you probably think about the cheap, loud, multi or bright-colored loose jackets that were popular among dads in the 90s. But if you shop properly, you'll be able to find a windbreaker that looks good, protects you from the elements and won't make you sweat. We’ll show you five that meet that criteria. My Favorite Windbreakers in a Short List! But What Exactly Is a Windbreaker? Wondering How To Style A Windbreaker? What To Look For When Shopping For a Men's Windbreaker? My Top Windbreaker Pick For 2018! If you’re short on time, here’s a quick recap of our favorites. Got 5 minutes? Keep reading to learn about what makes for a good windbreaker. A windbreaker’s sole purpose back in the the day was to shield you from the wind, and perhaps the rain. It has since evolved into a garment that can resist both the wind and the rain and are designed to optimize performance—be it running, hiking, farming or simply walking. There are also ones that are less performance-based for pairing with urban attire without making you sweat. But if you run, hike, camp, walk, kayak, climb or backpack in windy conditions, a windbreaker is a necessity. A windbreaker is a specific kind of jacket that can be used to protect oneself from the cold but is mostly used to protect from all elements like wind, rain and mud. They were mainly made of nylon material in the 90s but are now made of several types of fabric: nylon, polyester, micro polyester and tricot. Windbreakers only came in nylon back in the day. They had a tougher outer that made swishing noises anytime they were worn. The fabric was popular because it offers great protection against both wind and water. The downside was the noise it made while walking which made it slightly embarrassing for some people. Because of that, some people like to go for wholesale windbreakers with other types of fabric which are much quieter than the nylon ones. Polyester windbreakers are similar to micro polyesters ones and is noiseless in comparison to nylon windbreakers. They are however more bulky than nylon ones and slightly heavier in weight. They are designed with a mesh or cotton lining (which is warmer) and can be worn in almost all types of weather conditions. The good thing is about polyester windbreakers is that they come with several linings that you can choose from depending on the warmth you want. Micro polyester is a noiseless windbreaker. So none of those swishing noises when you walk around in them. It is a soft and lightweight fabric and is made mainly with a mesh or cotton lining so it can withstand water and wind quite well. They are great for hotter climates since they’re so light. Tricot is a brushed polyester fabric that is heavy in weight. It is quite soft and comes with a slight shine. Because it is so heavyweight, it doesn’t usually have a lining. However, the heaviness of the jacket makes it ideal for colder weather conditions and are very comfortable to wear because of their softness. Tricky windbreakers cannot withstand water well and they are also less resistant to wind. Styling a windbreaker doesn't have to be hard, check out this video to learn more. If you’re looking for a windbreaker, you need to check whether they come with the features you are looking for. Many come with an adjustable hood and offer better protection against the wind, cold and rain. Those types usually come with zippers to allow the wind to seep through. Some have zippers with flaps as well to protect against high winds. Also check the vents in the armpit area if you are looking for a windbreaker for warm weather conditions. Let’s move on to our list of the 5 best windbreakers for men. This Charles River Apparel windbreaker is easy to pack. It is lightly lined with soft cotton flannel throughout and quickly and easily packs into its front pouch pocket. That means that can travel with it, use it daily or keep it as an emergency jacket in your car. It is wind and water resistant and the adjustable shock cord drawstring at the hem helps to keep out wind and rain. Charles River Apparel are known for infusing their clothing with technology, performance and style; and this one comes with self-cleaning technology. The front pocket that the jacket folds into has a Velcro closure instead of zippers or snaps so that there is no way of going into the pocket or unfolding the jacket without people near you knowing—it makes that loud “rip” noise. You may find it to be an odd fit, it runs on the small side for some. So perhaps do measurements before purchasing it to ensure you get it in the correct size. Other than that, the jacket is great. It has a soft lining that works in all seasons—it’s not too cold and not too hot. 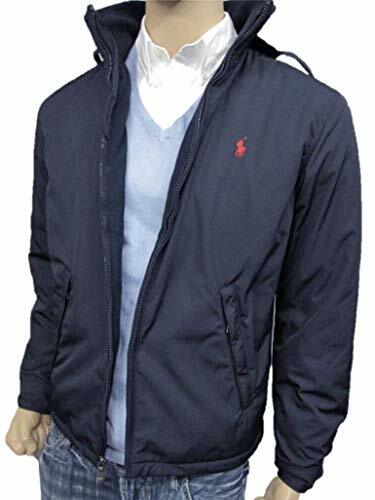 This Ralph Lauren perry lined windbreaker looks good and is versatile to go with different outfits and to keep you warm in cold weather. And it doesn’t make you hot either. The jacket is well made with good materials (made from 100% polyester). It is not loose but is quite narrow on the shoulders. Ralph Lauren clothes are normally cut loose but this one is a little more slim, but not too slim. However, you may find it to be too short if you’re a tall chap. This Under Armour men’s windbreaker is great for moist, humid and rainy weather. It is very breathable (which is important if you’re active) and form-fitting (it is 4% spandex). If you wear it in rain and it gets soaked, it is good at wicking water away from your body. Gravity seems to be at work because the water is quickly pulled downwards towards the cuffs and waistline and then quickly expelled. However, the jacket is not ideal for freezing temperatures and heavy rain. You may have to go down a size as, like most Under Armour clothing, it tends to run on the large side. It is not an everyday jacket—it’s a jacket for those doing activities like running as it is meant to fit snugly to the body to build up body heat and keep you warm. If you’re not exercising, then the body heat is not generated. Also keep in mind that the velcro cuffs are not designed well so it can stick to things. Another windbreaker from Charles River Apparel but this one is made from unlined wind and water-resistant softex polyester so it lacks into its own zippered front pocket to facilitate easy storage. It also has a half-moon shaped neck which allows for custom labeling. The underarm grommets are great for ventilation while the elasticized cuffs and an open hem with a shock cord drawstring help keep the wind out. It is also water and wind-resistant but can get damp in the pocket area while the rest of it remains dry in rain conditions. What we like about it is the style and versatility it offers: it is rugged, looks sharp and functions well as a wind layer. It won’t keep too much perspiration in so it can help to keep you dry. This U.S. Polo Assn. windbreaker jacket is quality and great for cool days. It is made out of 100% polyester so it comes in handy for windy days. It also has a warm, soft and comforting Sherpa lining which does not shed. However, this windbreaker jacket is not light or that cool. It will make you sweat in cool weather as it is insulated and traps body heat well. So it is definitely a cool weather jacket. It is however nice fitting and is well made. Out of the jackets we reviewed, our #1 pick has to go to the Charles River Classic Windbreaker. Its simple (yet effective) profile makes easy to throw on in a pinch and run out of the house. With lots of pockets, cotton lining, and protected zippers for storage, I really like this one!